Gratitude is the easiest way to bring more good into your life. Living a grateful life is a choice we all make. We can focus on what we don’t have, or we can be grateful for the many blessings we have in our life. For me, that choice is easy. I am truly grateful for many things in my life, and I take time each day to think about at least some of them, to give thanks, and be grateful for them. It really is the easiest way to bring more good into your life. This sentiment is from the Enjoy Life stamp set. The set was inspired by Connie Fitzgerald, a million dollar sales achiever with Stampin’ Up! It is a beautiful stamp set, and reminds us to be grateful for all the beauty and kindness that touches our lives. To make this card I used a clear block and stamped directly on it. I used the new In Colour Pineapple Punch, and Balmy Blue. I used a spritzer to wet the ink, causing it to run together and create the green which happened to be a very good match for our new Granny Apple Green! 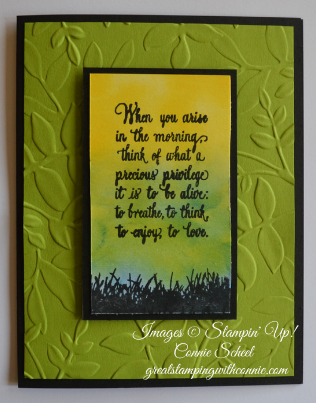 I used Granny Apple Green for my backdrop, and embossed it with the Layered Leaves TIEF. I stamped with Black Momento ink, and used Basic Black cardstock to really make the whole card pop.